There’s a lot more to getting an event organised than just booking a Phuket conference venue. Pointing out the obvious, I know, but the scale to which that’s true might come as a shock. It’s only once you’re deep into juggling everything from scheduling to catering to accommodation to budgeting to speakers to technological assets that you realise that this really does require a person working full-time on it, and a person with applicable experience, ideally. It’s either that, or you can say goodbye to any hope of productivity in any of your other duties for a while. Here are a few of the more compelling reasons why your company needs a professional conference organiser. In pretty much any industry, a job done by a professional will always be better than one done by even the most gifted of amateurs. If you’re having to learn as you go, you will make mistakes – that’s effectively guaranteed. Learning is, quite often, a case of trial and error. When it comes to organising a conference, errors can be expensive. It’s not just experience that agencies bring, either. With years in the industry, they have seemingly endless exclusive contacts with Phuket conference venues, vendors, entertainment suppliers and more. In many cases, they will not only be able to provide much better facilities than a first-timer could, but probably at a better price, too. Time spent trying to organise a conference when that is not your full-time role is time not spent in the role you have the most training and experience in, which means it is time used less productively. If you’re new to events organisation, that’s going to be a lot of time, which means a lot of lost productivity. While you’re chasing after every little detail of the thousands of details involved in coordinating a successful conference, you are not looking after maintaining and improving your business. Let an expert take over and the planning will be done in less time and with less of your time wasted. 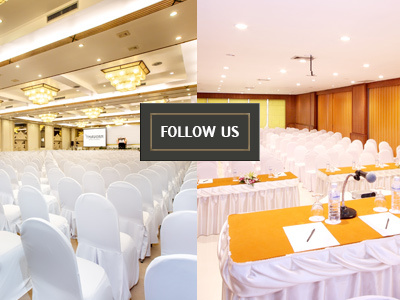 Even the most experienced and calm manager would be stressed out trying to organise their own team, as well as a Phuket conference venue and legions of suppliers, vendors, exhibitors and others, particularly if you’re new to the conference organisation game. Trying to get all of those little details mentioned above organised is stressful enough, but trying to coordinate them all to happen at precisely the right time, when even one tiny failure could potentially spell disaster for the entire event, is something else entirely. Hiring an agency to handle it means that stress is handled externally, with you having only a single point of contact you have to coordinate with.